Elopements are a perfect fit for Joshua Tree. Sculpted by both strong winds and the occasional downpour, this sprawling landscape of craggy mountains, massive boulders and spiky trees is unlike any other. It is simultaneously desolate and lush. A bizarre mix that has beckoned so many adventurous hearts to come and explore its wonder. From it’s unparalleled sunrises, to it’s awe inspiring starscapes, Joshua Tree National Park is an ideal destination for couples looking to elope, or find the perfect setting for wedding photos like no other. Come, lets venture into the desert. A visit to Joshua Tree always fills me with inspiration, so I've taken 10% off wedding and elopement packages in Joshua Tree National Park. Below you’ll find the perfect photography package for your special day, no matter how grand, or intimate it might be. I can’t wait to create with you! From dawn’s golden light, to nights stunning star display, we’ll venture into the park and capturing every heartfelt moment from your intimate ceremony to the last kiss of the day. Creating beautiful images and fun memories that we will both treasure for years to come. Your wedding photos are my artwork. So each and every photograph is lovingly edited to look its’ very best and I never place arbitrary limits on the number of images I deliver. Once they are ready you’ll receive the full resolution images on a USB drive. In addition, you’ll be sent a link to a private web gallery all your own. It’s perfect for sharing with your friends and family. It also enables you to order from my favorite professional print lab. Rather use your own lab? Print from your favorite photo lab to your heart’s content, and share them with your loved ones. I’ll make a short but sweet montage of your adventurous elopement through Joshua Tree. Getting married in or near Joshua Tree? My wedding coverage starts here with six hours. Perfect for an intimate wedding without a lot of events. We’ll make sure to still explore a bit and create unforgettables photos with the parks beautiful landscape. 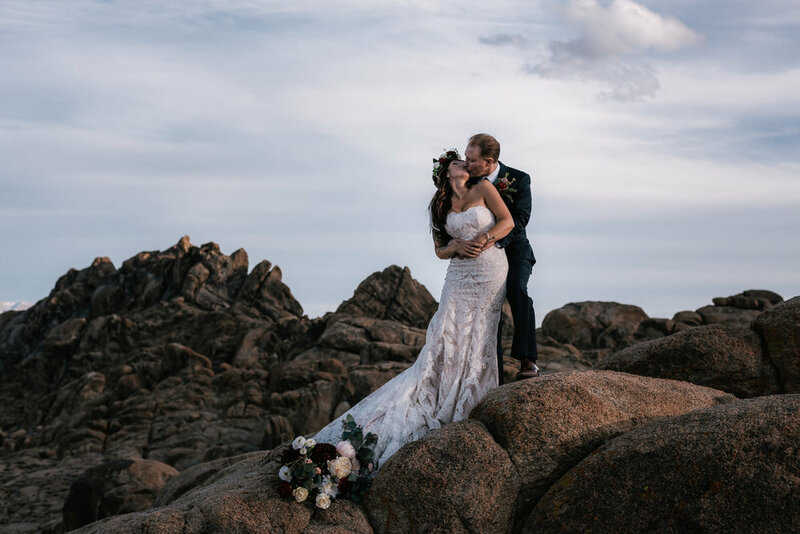 With all day coverage we’ll have no shortage of time to capture your love story from the mornings preparations, to the beautiful ceremony and reception, we’ll even have time to explore the national park in between. I’ll also bring a second shooter along for double the magic. My top Joshua Tree package includes everything needed to turn wedding photos into heirlooms you and your family can cherish for lifetimes to come. You deserve nothing less. It can be hard to know where to start when planning a wedding or elopement in Joshua Tree National Park. So I want to help. It’s my goal to ensure every one of my clients has the best elopement experience possible. From giving you advice on scheduling the events of your big day, scouting out your selected locations beforehand, to the little things like helping you carry your bouquet down the trail. I do whatever it takes to make your dream wedding a reality. Not only am I a photographer, I also am an avid backpacker, hiker, and dabble in off roading. 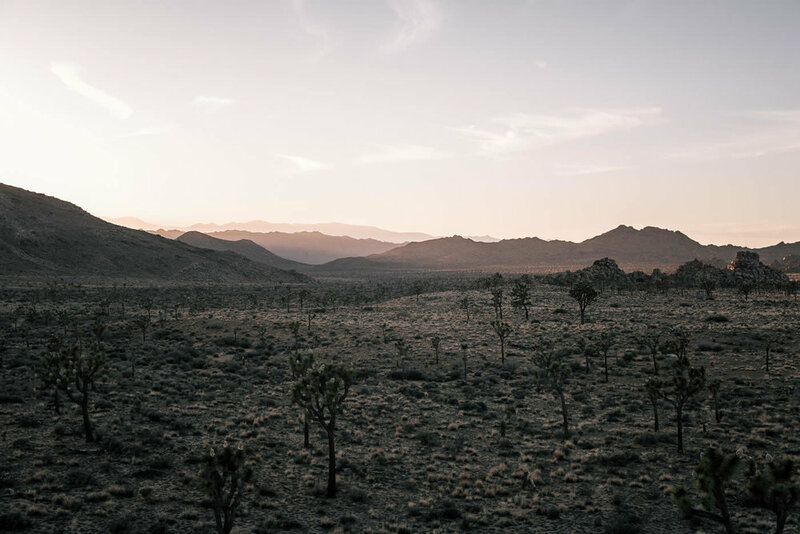 I’ve explored the popular sights, expansive trails and little known backroads of the National Park and know where we can find the perfect spot to make your vision of a Joshua Tree elopement a reality. From the iconic spots like Keys View, to the mountainous Old Dan Road, we’ll have an adventure and create something special you and your loved ones can treasure forever. Well so do I! Contact me and we can plan your grand adventure in love through this iconic National Park. Whether you’re eloping or having a traditional wedding, I can think of no place more wondrous. Let’s be adventurous!